Is it really Sunday night already? The weekends sure do pass quickly! I had a really nice weekend packed with lots of good things! It started Friday after work when a few work friends and I met at Dairy Queen to indulge in a celebratory ice cream treat. We finished out testing and decided a Blizzard was in order. I had salted caramel...heavenly! I also managed to squeeze in a quick trip to the consignment store and found a few things. 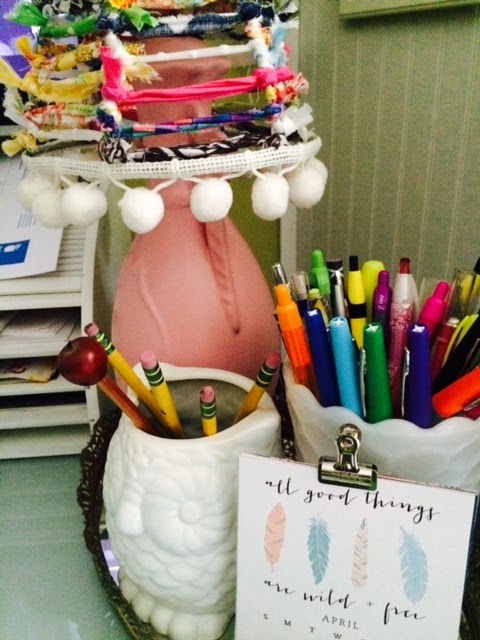 Let me share, First up is thispretty basket tray. I love the color! I had a plan for it when I bought it. You will see it in place in a photo later in this post. 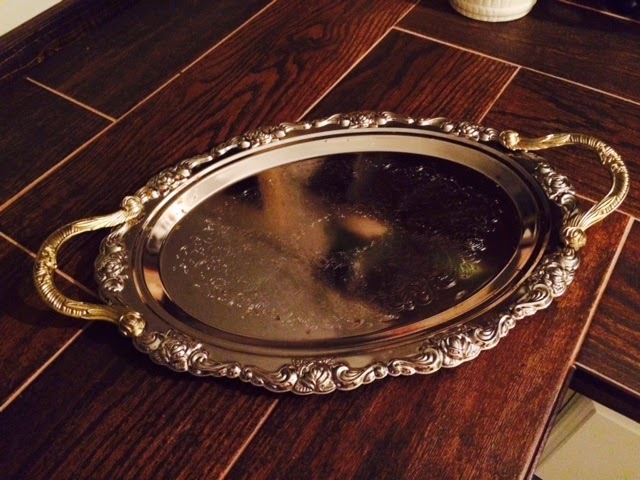 I also bought this pretty tray. It is silver with gold handles. I originally planned to paint it, but I didn't. You'll see it in place later in the post as well. I was thrilled to find this beautiful Waverly shower curtain. 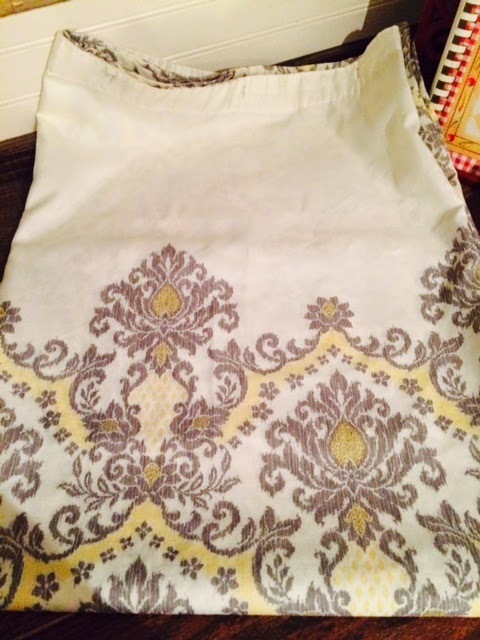 The top part is white and the rest of the curtain is covered with this beautiful print in grey and yellow. It matches my room colors, but I am not sure if we will need a shower curtain yet. I am hoping for an open tile shower when we remodel. I am planning to redo the guest bath as well though, so it can be used in there if I end up not using it in my bathroom. It is so pretty. After I left the consignment, I came home and the hubby and I went out to dinner, bought groceries, and stopped by Lowes to pick up a few things we needed. The next morning, my sister called to see if I wanted to go to a yard sale and thrift store with her. Of course, I said yes. So, I got up and got ready and we set out. There was mothing good at the yard sale, so we went to breakfast and then to the thrift store. I found a couple things to bring home. 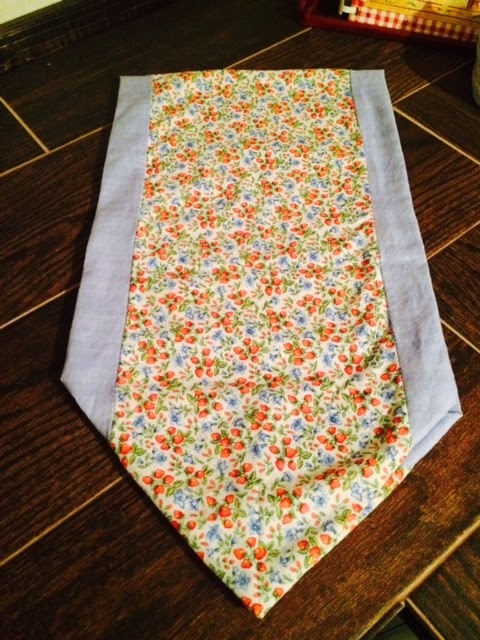 I couldn't pass up this sweet handmade table runner. It's folded in half here. Here's a close-up. I loved the strawberries mixed with the blue flowers. I have a plan for a tablescape using it soon! 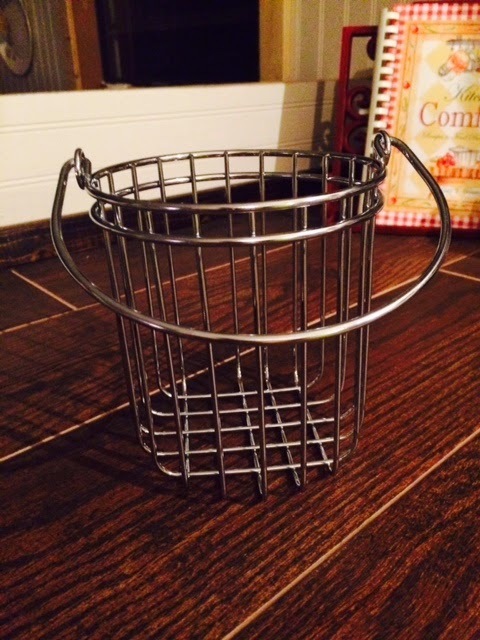 I also bought this little wire basket. Not sure what I will use it for yet, but for $0.79, I will find a use for it. The only other thing I bought was something for school. I didn't even photograph it. Anywho I came home and piddled around the house a little. The hubby went to the races, and I ended us going with my friend Jeana to dinner and Michael's. Like my adorable new $2.50 phone case I got while at Michael's? 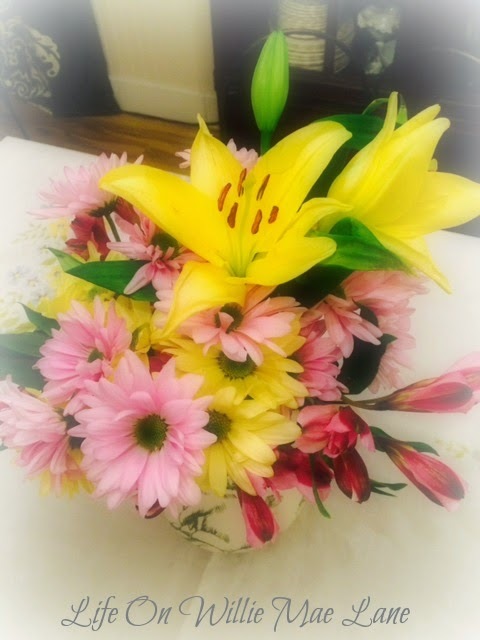 I love the bright yellow and pinks. 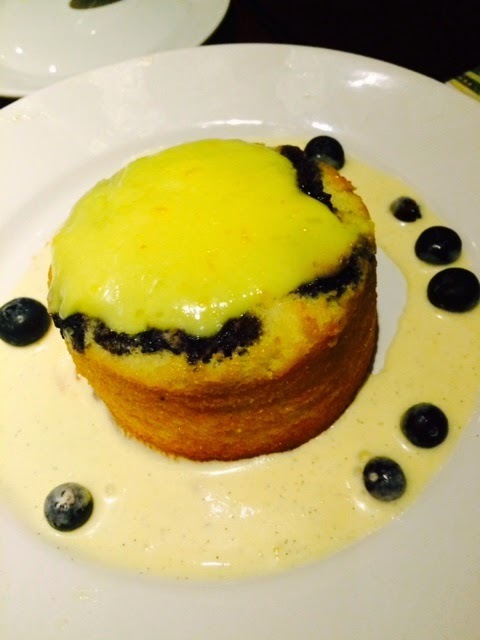 We ate a very tasty supper at Longhorn and then we split a yummy desert.....lemon blueberry cake topped with a delicious lemon custard. It was so good! OK...let me show you what I did with the basket and tray. See the basket peeking out on the right hand side of the photo below? 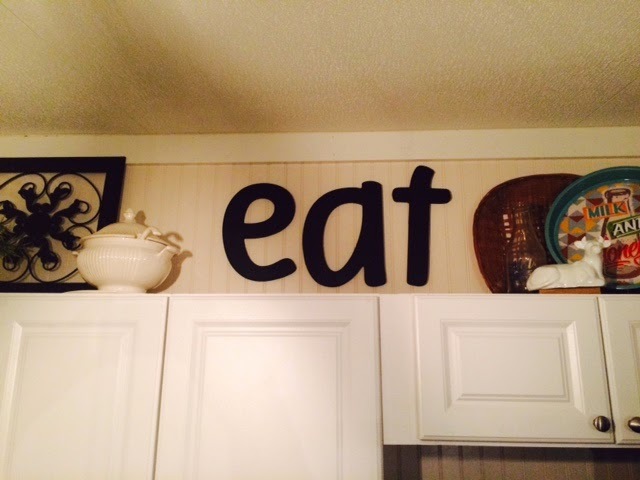 I also hung my EAT letters. I like them up there above the cabinets. Sorry for the poor quality of the photo. Here's what I did with the tray. 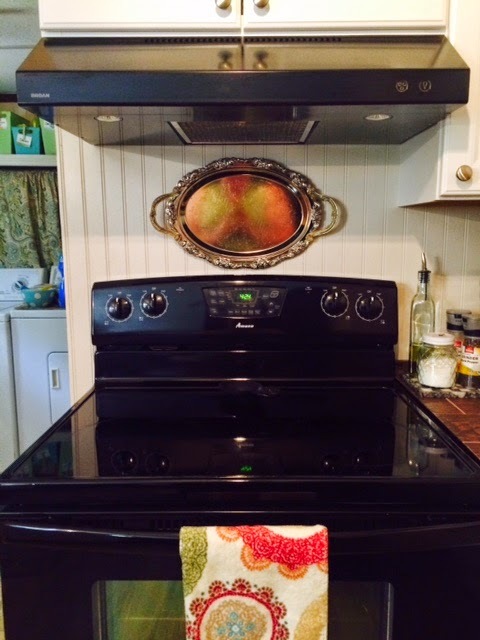 Notice my new range hood? Yep, that got checked off the list this week. The hubby also got my new dishwasher hooked up and I have now used it three times and love it! I am so happy to finally have one. I love being able to stick the dishes in as we dirty them and not have them sitting on the counter or in the sink until they get washed. I wanted to share one small addition to my open shelving. 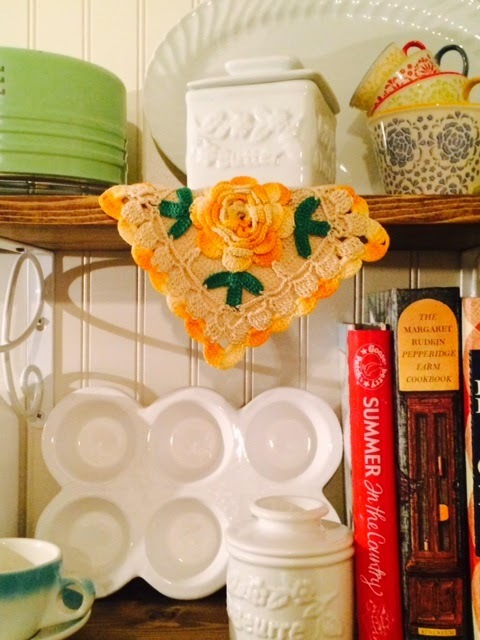 I added the beautiful crocheted pot holder that I won in Pam's giveaway. I love it...so pretty! Today we got the bar top ready to install and got some more trim work completed. The hubby worked on his race car today too though so we didn't have a lot of time to work on the kitchen. He needs a break from it every now and then! I spent a couple hours working on cleaning my craft room. It was quite the mess. I do love my happy space and am glad it is clean once again. Well, I suppose I should get to bed. I wanted to get a post up though since this week promises to be another busy one. I have the dreaded lunch duty this week...ugh! I also have sub plans to prepare before I leave work tomorrow since I will have a sub on Tuesday. My daddy is having surgery Tuesday and I want to be there with him and mama. I would appreciate your prayers and good thoughts for him. Thank you so much! I hope you have a lovely week. I plan to! I'm Back...and Have a Kitchen Update! Two week....I can't believe I haven't blogged in two weeks. Not that I haven't thought about it a dozen times, but I have been busy folks! 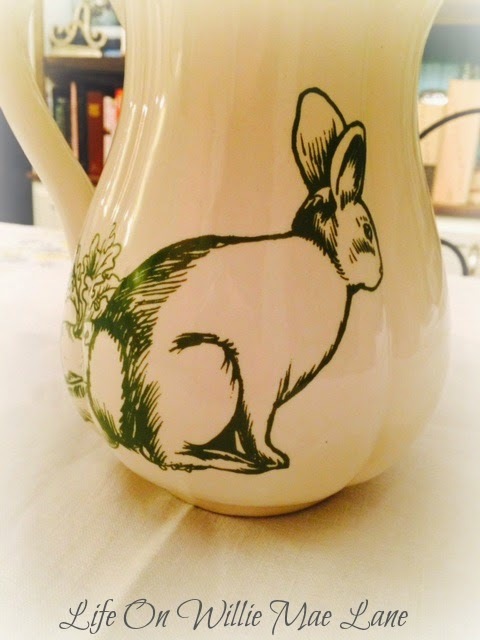 Busy spending time with family and friends, working on the kitchen, teaching, and so on. Life is good and I am blessed beyond measure! 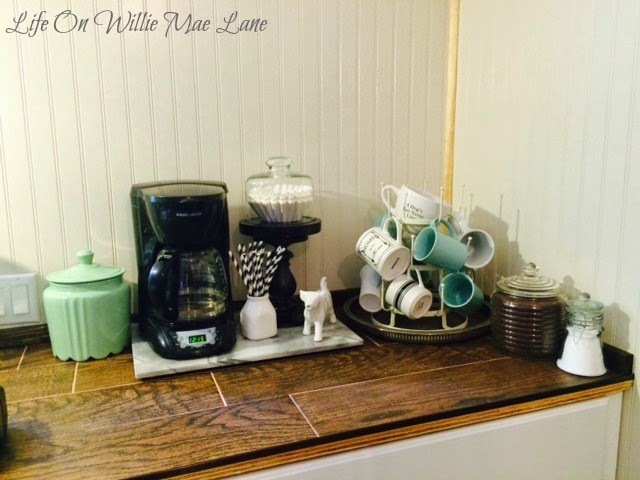 I'm happy to have time to share a little kitchen update and a sweet giveaway I won. Here are some pretty flowers I offer up as an apology for my absence. 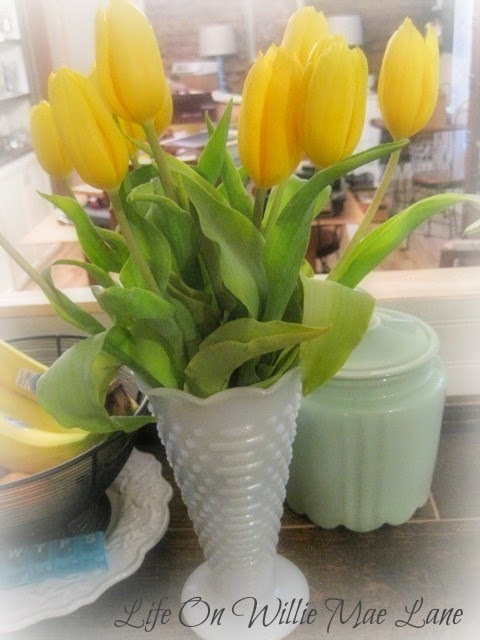 I've never bought tulips before. I don't know why. They are so pretty! 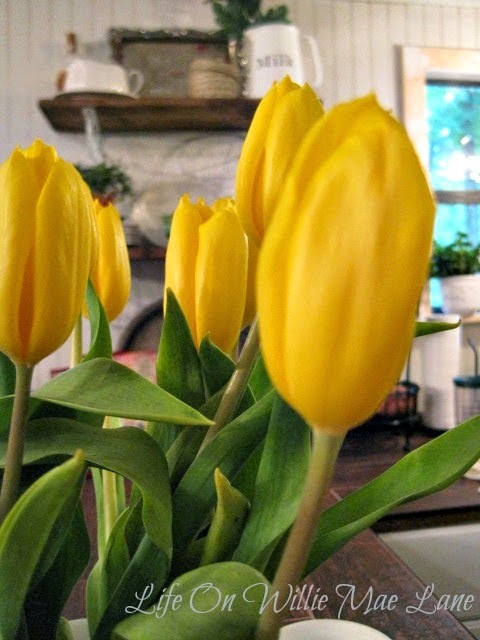 I love this bright, sunny yellow. If you look beyond the flowers, you can see a bit of my new shelves. Would you like to see more? Here you go! 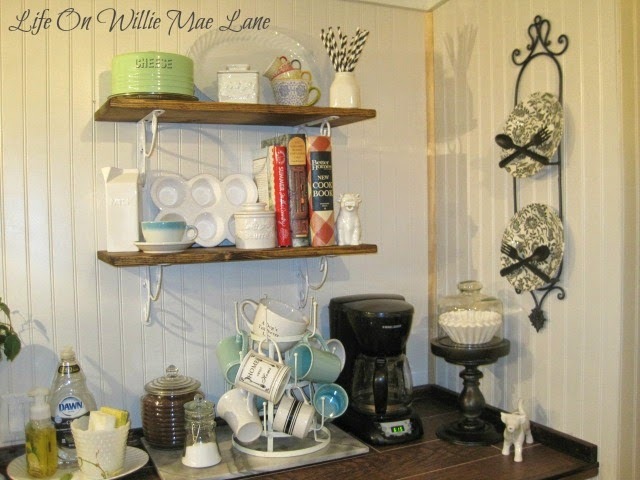 I am so excited that the hubby finished my shelves last week. I have been impatiently waiting for them for weeks and I am in love! I had so much fun creating vignettes on them the night he finished them. I'm sure they will change frequently, but I'm happy with them for now. These are on the left side of my window and sink. And, these are on the right side. I'll share a photo of the whole wall when I finish painting window and corner trim and sew my curtain. Soon...very soon! What do you think? 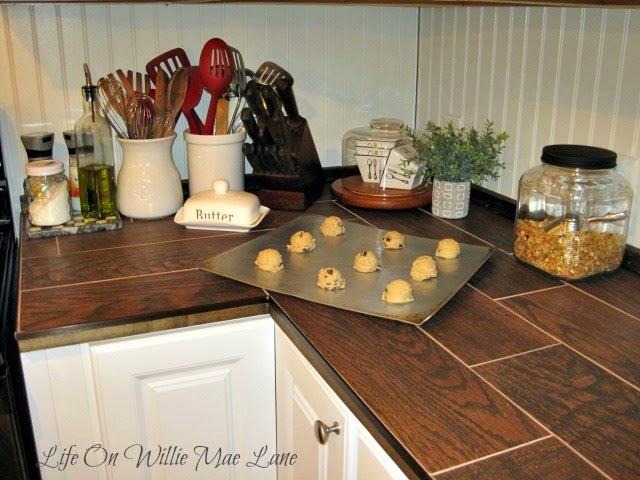 I am still loving my wood look tile counter tops. They are so beautiful! We got the veneer edging on and stained. 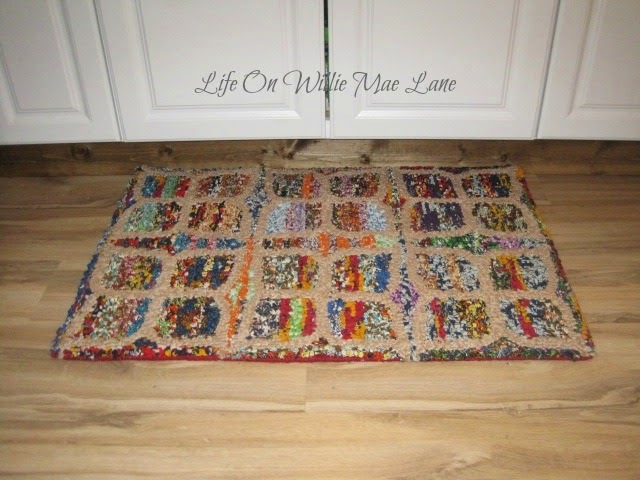 Here's the new rug I ordered from Overstock to go in front of the sink. I had reward points from an order my sister placed through my account, so this rug didn't cost me anything! I wanted something bright and colorful and that's what I got. You can see the toe kick we put in today. I wanted it stained instead of painted white. I thought that would be easier to keep clean. We installed the flooring last week. I think that's it. We are so close! I never realized how many little details there are to a kitchen remodel. It has been a lot of work, but so much fun too. I have enjoyed seeing my vision come to life before my eyes. Such a rewarding feeling. 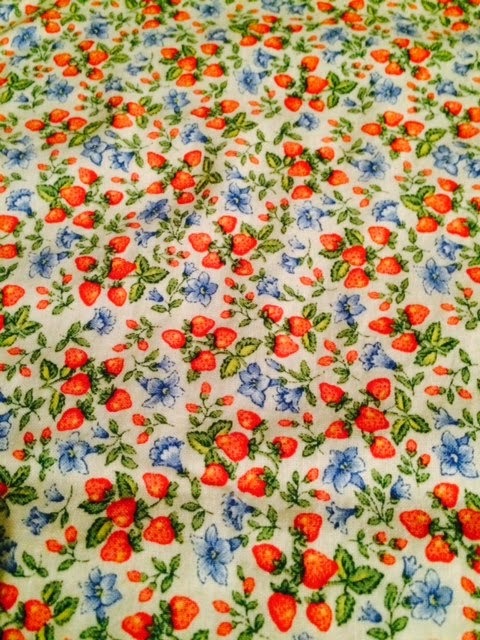 I love this little tablecloth...so springy! It will soon be adorning my table. That is as soon as we get all the remodel tools off of it! I love the sweet little strawberry dish that was included in the giveaway. Some of you know I love setting my table with a strawberry theme on occasion! I can't believe it's been two weeks since I last posted. The kitchen remodel has consumed all of my free time. I am happy to report that we are nearing completion. I have a few photos to share with you today though. I have been looking forward to Easter weekend because both my kids were supposed to be home for Easter. Well, I started feeling bad on Thursday but I went to work on Friday due to the kindergarten Easter party. I did not want to leave a substitute with that chaos...lol! I was able to leave work early though. I have progressively gotten worse over the weekend and am thinking I may have strep throat. I've never had it that I can remember, but something is definitely going on with my neck and throat. I am so miserable. I have been trying to power through the weekend though and am making sure I don't get too close to anyone. I don't want to share whatever this is. And then, my son, Dakota said he thought he was going to have to work on Easter which makes me sad. He may be able to come for a quick visit though. 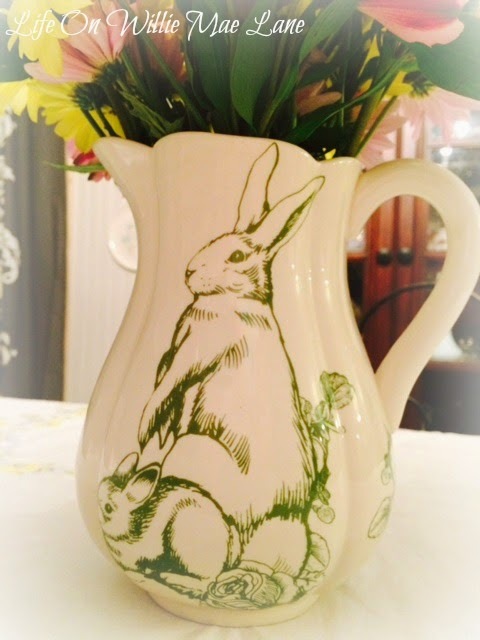 This bunny pitcher full of flowers was my only Easter decoration this year. My new kitchen was definitely worth giving up my decorating this year though. 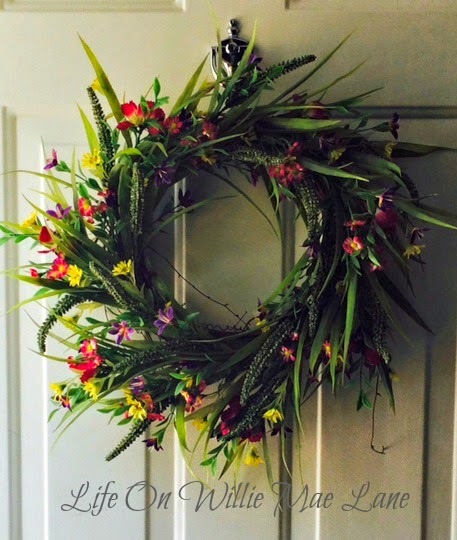 I did hang my thrifted spring wreath on the front door too. Sorry about the dark photo. 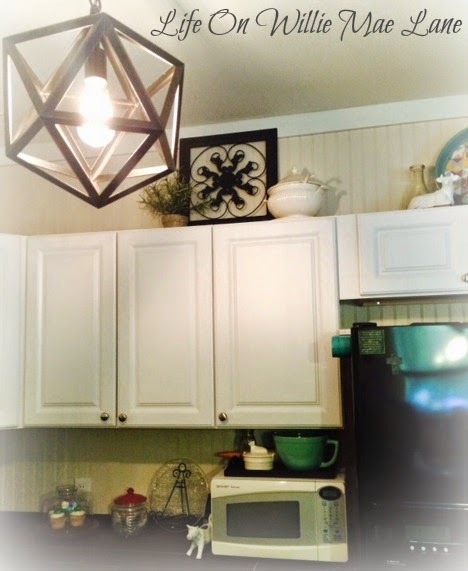 Now, let me share a few sneak peeks of the kitchen. We still have to finish the bar top, pantry, and flooring, open shelving, along with a few other things, but the major work is DONE! I love this corner! 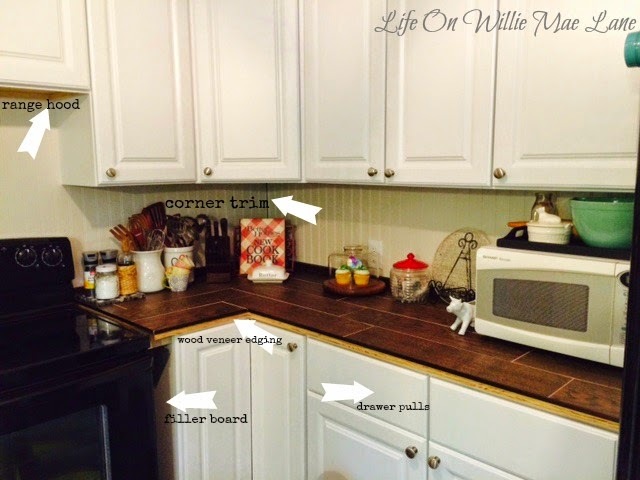 And I am in love with my wood tile counters! The next photo shows all the details that are unfinished. Here's the coffee station. It isn't finished either. The corner trim needs to be painted. The wood veneer still needs to be put on the edge of the counter and stained. 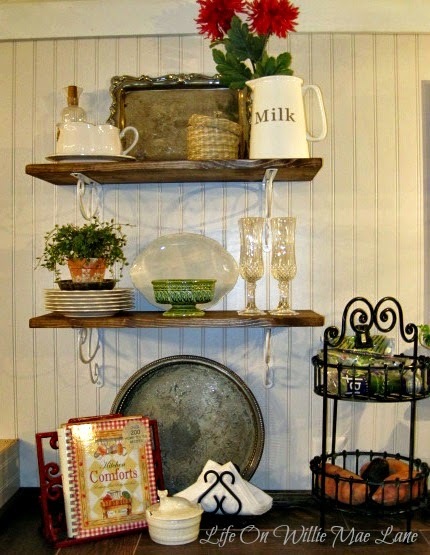 There will be open shelving on the wall above the coffee pot as well. My sink is in but I didn't get a picture of it yet. 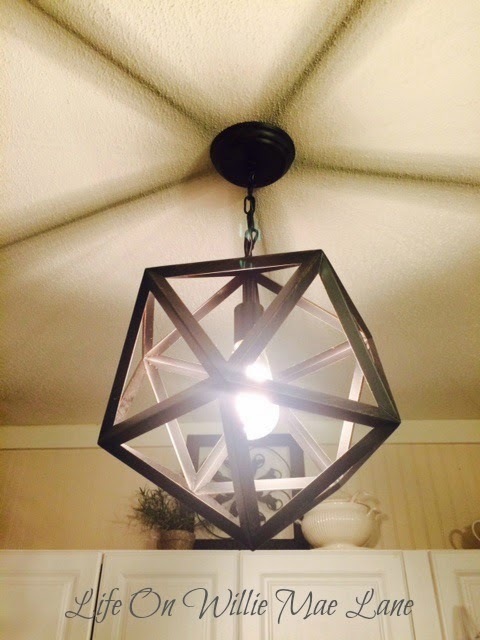 My new light fixture is gorgeous! I love the design it casts on the ceiling. 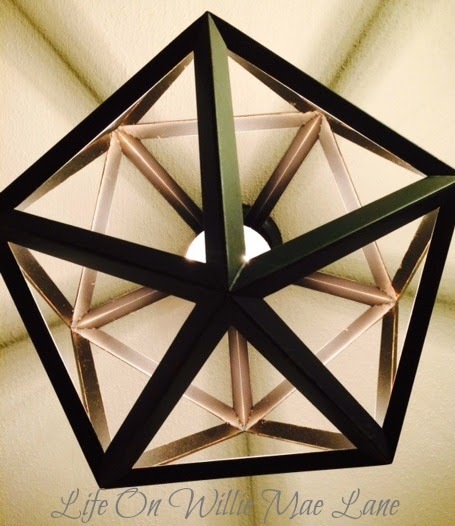 This is taken from beneath the light. Isn't it neat? I'll be back as soon as I can to share some more. 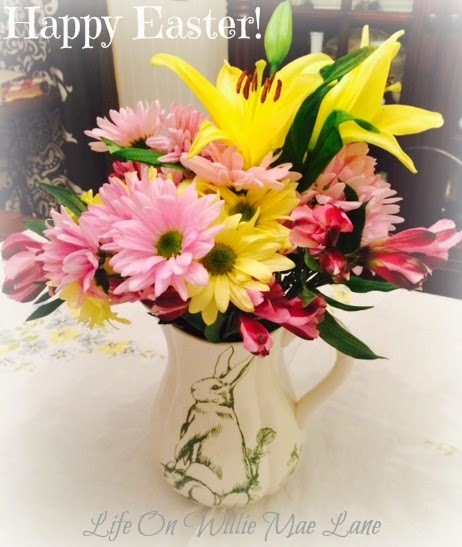 I pray each of you has a blessed and beautiful Easter spent with your loved ones.